In table tennis, there is some available sponge thickness for the rubber: 1.5mm, 1.8mm, 2.0mm, 2.1mm, 2.2mm, 2.3mm or max. So which one should you choose? What is the effect of the sponge thickness on the playing style, the spin, and the speed? It’s not only the color (black or red), but also the sponge will decide your feeling when you hit the ball. Some players assume that “thicker sponge is good for topspin, and a thinner sponge is good for flat hard hit”. Is this correct? Or another says: “a thinner sponge brings more feeling. And beginner should use a very thin rubber 1.8mm”. Is it good? There is also a debate about this “A big lie about sponge hardness”. So who is right? But first of all, why we need a sponge in table tennis? What is the role of a sponge? That’s the reason why, for the soft stroke (like service, drop shot), the topsheet will generate spin. But for the strong stroke (forehand attack, topspin), that’s the blade will generate a lot of power (due to the stiffness). Or you will feel more your blade when you do a bigger stroke. The sponge has 2 roles: compressor and energy storage. Many coaches didn’t understand the benefit of this “compressor”. And they always recommend a very thin rubber to a new player. Like, “hey, if you are new to table tennis, choose only 1.5mm to 1.8mm”. They say that a thinner rubber will give you more control. I feel sorry for this player. Why? Because by playing with too thin rubber, a new player will form a “very bad habit” during the stroke. Thin rubber will bottom out very soon. So a new player will hit more “upward” to fight with it, to lift the ball. But this technique is very bad. 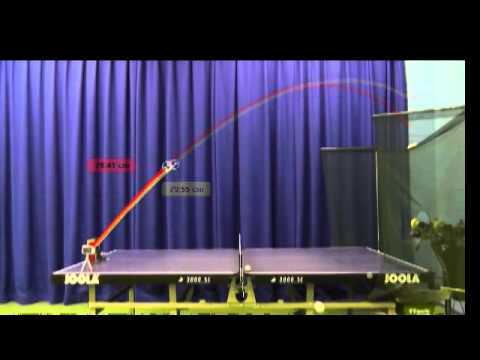 In table tennis, we need to hit more forward, but not “upward”. And this player never knows this feeling. The feeling that the “compressor-the sponge” will absorb the ball. The thicker sponge, the ball will sink more. This will give the sense of “control”- of “dwell” in your big stroke. Read more about the “big lie” discussion above. The second role of the sponge is energy storage. If you use a very thin sponge, thin like a paper. What happens? In every shot, the ball will hit directly to the blade. It will bottom out in every shot. The throw angle is very small. And there is no energy stored. If you use a very thick sponge. There is a lot of thickness for compression. The energy is stored, and you can hit very hard without bottom out the sponge. But the final phase “sponge springs back and releases the force” is not fast. Because the blade won’t participate in your shot. You just play with the sponge. Which is not good for your feeling. Also, the too thick sponge would be a too heavy rubber to play. So if you can hit hard, choose a thicker sponge from 2.1 mm to MAX thickness. That’s why top players always play with MAX thickness. Because they are trained to hit hard in every shot. So what is control here? Why many new players say that “this rubber is too fast, I can’t control it.” And right away, his coach says “choose a thinner rubber. Or a softer rubber”. This is a very bad choice! Why? It’s not a rubber which is too fast. But it’s the blade! Many coaches and players didn’t realize this. That is the blade is too stiff, and that the player doesn’t get any “feeling” from the blade. You need a good dwell time to feel the ball. For any thickness and hardness of sponge, there’s some maximum amount of energy it can store during compression. If you hit hard, and you pass this limit, then the “bottom out” will happen. You should avoid the “bottom out” effect. you’re going to lose energy on the shot. This is the main reason why professional players play with Max thickness sponge. The feeling of Hurricane 3 2.15mm is totally different from the Hurricane 3 2.2 mm (especially when using with booster). Thickness has the limit, due to the rule. (4 mm). Increase hardness. That’s why the top Chinese player plays with hard to very hard rubber. To increase the limit of Energy storage, to remove the bottom out effect, and to increase the spin and speed. As you know that sponge thickness is measured in mm. And thicker sponge can store a higher amount of Energy (or catapult effect). While control also depends on the blade, the catapult speed depends mostly on the sponge thickness. It depends on your hitting power. But don’t choose too thin rubber, or too soft rubber, even you are a new player. For the backhand side, choose something between 2.0 mm (new player) to 2.2, or Max (intermediate player). For the forehand side, choose 2.1 mm or Max. For the Chinese rubber, you need to tune, so choose 2.1 to 2.15 mm. Don’t select a max thickness for Chinese rubber. Because boosting a Max thickness, you will lose the feeling. I’ve explained how to boost Chinese forehand rubber here. To improve fast, you need to train like a pro, with a similar set up of the advanced players. Thank you coach for your great work as always. I have only one question about the Tenergy 5 hard rubber ( the new one ) should we use the maximum sponge thickness too or apply the same rule of thickness of Chinese rubber as you explained above to leave room for boosting ? Thanks again for your help coach. Tenergy 05 Hard is not a Chinese rubber. And you don’t use the booster on Tenergy rubber. So choose the Max thickness. Thank you so much coach. You’re the best. why don’t you mention sources? this is rewritten article from butterfly pro coach with addition of Larry Hodge’s book. I’ve read the article from Butterfly. But these advices of thickness are my own observations. I fully agree here and I have adhered to these rules for my kids after listening to nonsense talk from sellers and coaches too long.definitely the way to go.